Some stories have to be discovered over and over again as you write. More than two years ago, I had the idea for a book about a kid named Blue who’d been left in a strange old house filled with madcap, ill-fated relatives. Blue’s story felt important, but things weren’t quite gelling for me. Then, Tumble walked into Blue’s life. She was a bright spark from the very first line. She had big dreams. She wanted to be a hero. She wanted to save the world, starting with that kid Blue who seemed to need a friend. And she wasn’t willing to sit on the sidelines. So I scrapped everything I had written and started over. 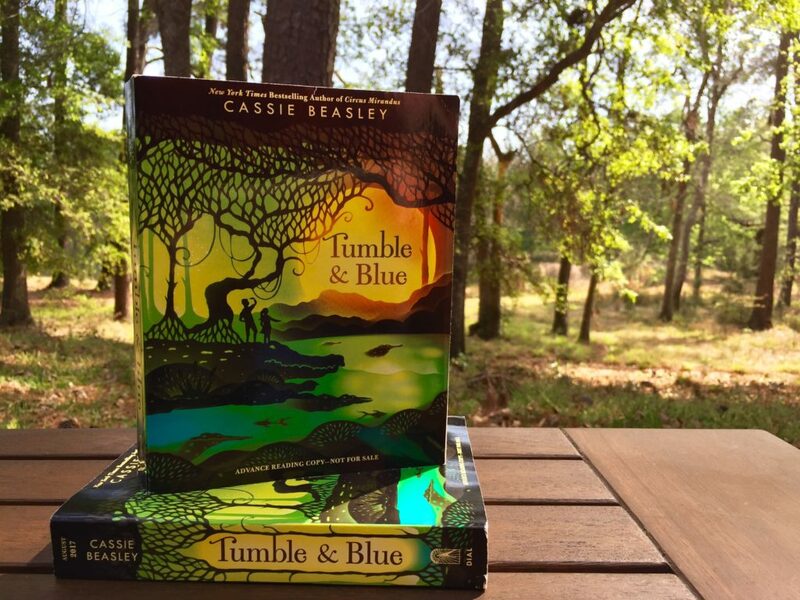 Tumble & Blue became a story about two friends challenging their terrible fates. It became a story about a girl who refused to give up no matter how many times her heroic efforts turned disastrous. And about a boy who was determined to be a winner, even though he’d been cursed to lose at everything from tiddlywinks to tic-tac-toe. It’s an adventure set in the Okefenokee Swamp. And it’s a story about friendship. It’s a book about curses and complicated families and heroes with feet of clay. It’s about Tumble and Blue and an alligator named Munch. I so hope you will, too. Tumble & Blue will be out in August. I’m endlessly grateful to the people who helped make that happen. Namrata Tripathi, for being a truly gifted and dedicated editor. After more than a year of work, when I was worried that I couldn’t put this story I cared so much about on paper, you asked me to keep going. Tumble & Blue might not exist at all if not for your encouragement. Rosanne Lauer, for your eagle-eyed copyediting. Without you, everyone would know what a mess my punctuation can be. Samira Iravani for the fantastic cover design. Hari & Deepti for the cover art. Which is beyond anything I could have imagined. Your work steals my breath every time I see it. Dial and Penguin teams for everything you do. I’m so sorry I don’t know every name, but I do know you’re there, helping design and market and publicize this book and so many more. You help stories find their way to the readers who need them. Which, as far as I’m concerned, means you change the world every day. Elena Giovinazzo, for being a super smart, super kind, super agent. See Hari & Deepti’s beautiful process for creating the cover art at Entertainment Weekly. You can pre-order Tumble & Blue from just about anywhere. Including your local indie bookshop. Add Tumble & Blue on Goodreads. could you let me know where you will be doing booksigning events or a launch party for your new book “tumble and blue” as i’d like to be able to order 2 signed first printing copies for my collection…..thank you so much and much success with your new book….martin magovsky….from malnate, italy…yes, im emailing you from italy!!!! !